Do you want to feel great about yourself? Would you like to see all that you wish for come to fruition? Do you want to find the right balance? There's a secret weapon that will make it all happen-and it's You. The way you think about yourself will be your true ally in living an inspired and balanced life. Your ability to think positively and believe in yourself will form the cornerstone of your success. Here are five strategies to help you become your own champion. Many U.S. based companies are expanding into foreign waters, outsourcing their manufacturing, etc. to countries abroad. Topics include 1) where are the opportunities? 2) Overview of general business environment, trends, developments, opportunities and challenges; 3) Mergers, acquisitions and investment opportunities; 4) technology transactions (licensing, etc); 5) Intellectual property issues; 6) etc. Click Here for more WITI Podcasts! The motto "Be prepared," isn't just great advice for Boy Scouts; it's also great career advice. You never know when the perfect career opportunity will present itself. If a recruiter called you today with your dream job, would you be prepared to send out an up-to-date resume right away? OLC's mission is to offer world-class, cost effective services to companies to enable them to achieve their performance and profitability goals and build capabilities that enable high performance. 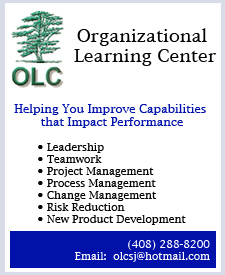 OLC is a non-profit consulting company registered with California. OLC associates have extensive real-world experience in helping industry leaders, managers and employees improve their capabilities and performance. "Navigate the Unexpected with Confidence!" 1) Know what can go wrong; 2) zero in on the most serious risks; 3) improve risk strategy decisions; and 4) ensure your business continuity plan addresses the real threats to business resilience. The Workforce Performance business-oriented framework provides targeted, solution-oriented educational sessions, workshops, certificate programs, and a dynamic exhibit showcase. Workforce Performance brings together an international community of learning, training, HR, organizational, and workplace performance professionals looking to explore strategies and technologies, exchange ideas, generate new practices, and learn how to leverage what's new and what's next in technology.